Amount of Contracts and Grants Awarded for Research Campus Wide Hits Record Level; $26 Million Represents a 50 Percent Increase in One Year. Fresno, Oct. 3 — Research activity is booming at California State University, Fresno where faculty are attracting a growing amount of support for studies ranging from how to use new technologies to improve the skills of K-12 teachers to groundbreaking experiments in cell genetics. The range and diversity of funded projects makes the Fresno State’s University Grants and Research Office an extremely busy place. The office set a record for attracting grants last year, reaching $26 million, an increase of more than 50 percent in one year and 100 percent over two years. According to Thomas McClanahan, associate vice president for grants and research at Fresno State, the variety, quantity and quality of the university’s grant projects demonstrate Fresno State’s role as the Central Valley’s major regional university. The university’s strong traditional academic programs, rapidly developing technological and science capabilities and its efforts to serve more diverse students are attracting growing grant support, he said. “Fresno State’s President Dr. John Welty and Provost Michael Ortiz also recognize the close relationship between quality teaching and the research and outreach made possible by grant funds. They strongly encourage new and innovative projects that advance our mission,” McClanahan said. McClanahan said there is a great need on campus for new laboratory space, new equipment, library expansion and improvement, and additional support staff to manage complex research projects. University President John D. Welty said the university is expanding its research capabilities so that students and faculty can benefit from new knowledge and increased opportunities for learning. 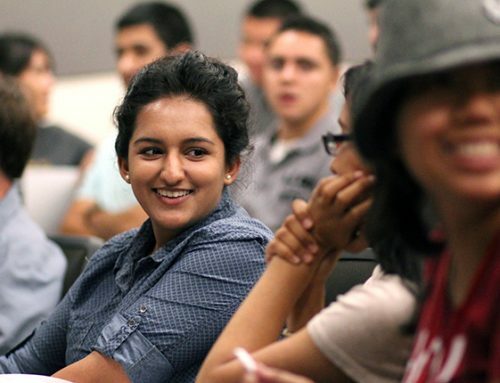 Fresno State’s success in attracting grants is having a positive impact in local schools. For example, at Bullard High School next year, Fresno State professors will be lecturing, helping students design websites and interacting via the Internet with their counterparts in Mexico, Argentina, or Spain. All of these activities will be part of Crossing Academic Borders, a National Endowment for the Humanities funded project. Basic research is also being accelerated at Fresno State through a series of governmental and corporate grants. As the result of one major national grant, Fresno State’s College of Science and Mathematics is undertaking new research on the genetics of cell death in plants or diseases in pepper crops. Professors Alejandro Calderon-Urrea and Jim Prince’s research is made possible by a multimillion-dollar grant from the National Institutes of Health. More than 20 other faculty from chemistry, viticulture, animal science and plant science are also involved in funded research through a $2.3 million state grant called the Agricultural Research Initiative. The W.K. Kellogg Foundation awarded Fresno State one of only 18 $100,000 planning grants to develop ENLACE, ENgaging LAtino Communities for Education. Under the direction of Dr. Thomas McClanahan, Associate Vice President for Grants and Research, Fresno State is establishing partnerships with rural schools and community organizations to design and implement a national model for increasing the number of Hispanic students who complete college. The University was selected from a national field of 122 universities and colleges. Eight to 10 of these finalists will receive $2 million implementation grants. Components will include early outreach to Hispanic students, parent action groups, academic enrichment in language and mathematics, teacher development, and pilot international Internet partnerships with high schools in Argentina, Mexico, and Spain. The Division of Student Affairs was awarded a five-year Gaining Early Awareness and Readiness for Undergraduate Programs (GEAR-UP) to conduct intensive and long-term enrichment training to middle school students. 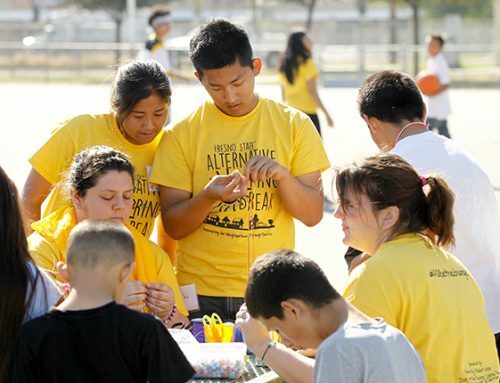 GEAR UP focuses on assisting students at McCabe Junior High School in Mendota. It provides a wide range of support services including after school tutoring and summer programs for these students through middle school and high school. The program focuses on preparing students for college as they graduate from high school. The program assists the same students for a five-year period to document the effectiveness of various support programs for students and their parents. This five-year grant totals $1,858,546. It will serve as a model for successful, long-term strategies to assist all schools, especially rural ones, in meeting the college preparation requirements of its students. Ms. Alejandra Juarez (278-2271) directs this GEAR-UP program. The College of Agricultural Sciences and Technology (CAST) received funding from the USDA for the Intersegmental Coordinated Outreach Program. Dean Dan Bartell (278-2061) recruited Ag Leadership colleague Lonna Torrico from the Fresno Unified School District to assist Dr. Dennis Nef, project director, with efforts to recruit minority students for CAST. During the academic year, Torrico, accompanied by other Ag faculty and staff, visited over 400 high school students, engaging them in exciting hands-on science and technology lessons related to agriculture. Several students were recruited for the ICOP Summer Bridge program. During the weeklong residential program, 15 newly enrolled freshmen Hispanic students attended seminars and workshops and met with Ag faculty and staff who advised them on CAST programs and ag-related careers. The College of Arts and Humanities was awarded a highly competitive grant from the National Endowment for the Humanities to work with Bullard High School teachers on Crossing Academic Borders: The Humanities and New Technologies. Dr. Vida Samiian and Dr. Thomas McClanahan are co-directing the project, which will revolve around three themes: “The Immigrant Experience,” “John Steinbeck’s America,” and “The Hispanic World.” Components include implementation of a new humanities strand into Bullard’s curriculum, lectures by Fresno State humanities scholars, content and technology workshops for teachers and international school partnerships. The Craig School’s University Business Center was awarded $480,000 from the U.S. Department of Commerce’s Technology Opportunities Program (TOP) to create Venture City Online. Based on highly successful programs administered by the UBC, the project has three web-based components: to encourage entrepreneurship among high school seniors, to provide online entrepreneurial training for adults and to create a virtual incubator. The TOP grants round received 662 applications for $12.5 million. Fresno State was awarded three grants by the U. S. Department of State that reflect the university’s international emphasis. Professors Al Evans and Don Leet provided instruction and hands on experience to two groups –non-profit organization leaders from Russia and business leaders from Belarus. Dr. Barlow DerMugrdechian led a Fresno State faculty exchange with faculty and students from Yerevan State University in Armenia. Professor Bill Mallios also directed a faculty exchange with faculty and students from the International Institute of Labor and Social Relations in Belarus. These three grants, totaling almost a half million dollars and involving over a dozen faculty members, reflect the prestige Fresno State faculty have in the international community. They are also just three examples of a wide range of international efforts by Fresno State faculty to improve classroom teaching through their experiences of teaching and working with leaders and faculty from other countries throughout the world. The School of Education and Human Development was awarded a three-year grant totaling $1,145,910 from the United States Department of Education to train future teachers to better use technology in the classroom. The grant will bring together clusters of university content area faculty and K-12 teachers to collaborate on restructuring key course in the content areas to infuse technology and strengthen students’ knowledge and skills in effectively implementing technology. Credential program cohorts will be developed to focus on leadership in technology and its incorporation into the classroom. The grant will also expand the Pre-Teacher Assessment Center by developing a new technology-focused teaching simulation. Professors Roy Bohlin (278-0245) and Robin Chicero (278-0362) direct this program titled Teaching And Leading for Educational Needs with Technology (TALENT). Fresno State faculty, under the leadership of Dr. Shirley Kovacs (Biology), will receive more than $5 million over the next four years from the National Institutes of Health to establish SCORE, the Support of Continuous Research Excellence Program. SCORE is designed to enhance faculty and student research. Initial support from NIH will provide funding for program administration and three faculty projects. Dr. Alejandro Calderon-Urrea (Biology) will conduct research on the molecular genetics of programmed cell death in plants. Biology faculty member Dr. James Prince will study phytophthora root and crown rot resistance, one of the most damaging fungal diseases affecting pepper. Math Professor Moses Cohen will focus on the development, testing, and implementation of algorithms for EEG analysis, the results of which will be combined with findings from cognitive testing, clinical exams, and imaging to develop a comprehensive tool for evaluation of new drugs and rehabilitation strategies in the treatment if Alzheimer’s disease and stroke. Dr. Fred Schreiber, Biology chair, will lead a collaborative effort designed to bridge community college education to a baccalaureate degree from the university. “Bridges to the Baccalaureate Degree” will partner Fresno State with Reedley (Madera and Clovis Centers) and Merced Colleges to increase the number of minority transfer students entering Fresno State as science majors. The program will offer integrated advising, instructional and research elements to students interested in pursuing biomedical careers. The three-year program will receive approximately $485,000 through the Minority Biomedical Research Support (MBRS) initiative of the National Institutes of Health. The State of California has awarded the College of Social Sciences $134,000 for a one-year grant to help K-12 teachers meet the new California History and Social Science content standards. Raising the Bar: Building Excellence for the New Millennium – Strategies for Meeting the Challenge of the New History/Social Science Content Standards will include a series of workshops for K-12 teachers. These workshops will help them to better understand these standards and learn skills and strategies for incorporating them into their curriculum. This is an interdisciplinary project that involves Professor Jeri Echeverria (newly appointed associate provost), Professor Jacqueline Carr in History, and Professor Susan Harris in Curriculum, Teaching, and Educational Technology.